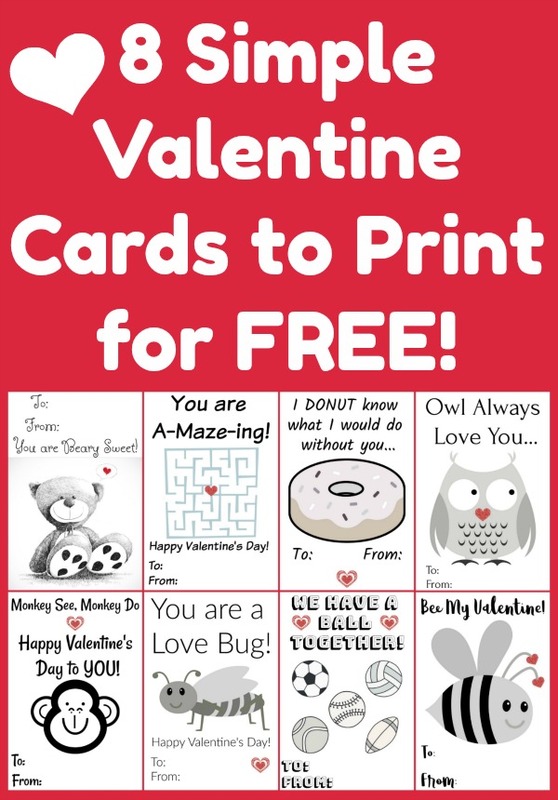 8 FREE Simple Print-and-Color Valentine Cards! 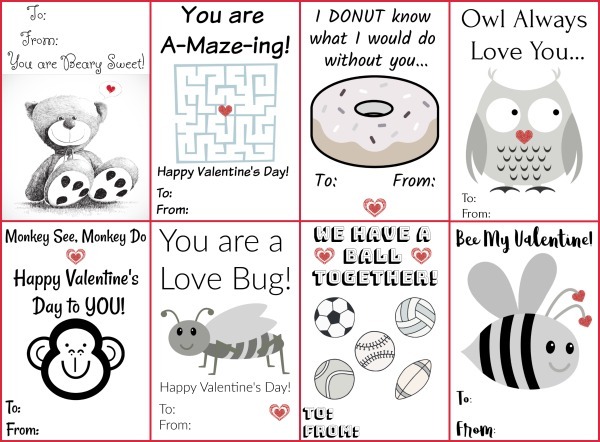 Nothing fancy, but still so sweet: These 8 Simple Print-and-Color Valentine Cards are free for you to print and use with your kids! My favorite part is that they are mostly black and white, so you can print in “grayscale” if you want to so that they don’t use much printer ink! Then you can glue them onto colored paper if you want, or have your kids color them, which makes these cards more personal and more fun! Our new-to-us 5-year old son LOVES projects of all kinds. He loves to be busy, loves to play, loves to sing, loves to help us with projects around the house. It is incredibly sweet, and also a little bit challenging as we sometimes have big-kid and adult-sized projects that a 5-year old can’t help with. We’re working to train him to play on his own or to work quietly at a table by himself sometimes. This is tough for any 5-year old, but maybe a little more challenging for this one. Ready to get your free Simple Print-and-Color Valentine Cards? Simply enter your email address into the form below, confirm that you’d like to receive the information, and you’ll be connected to our Heavenly Homemaker’s Learning Zone where you’ll get this freebie and MANY MORE!! Want more fun Valentine projects to work on? Find 32 Awesome Valentine’s Day recipes and activities here! Hi Laura. I would love the Valentines print outs. I might send them to my friends. Thank you! Enjoy! Hope you have a wonderful Valentine’s day!